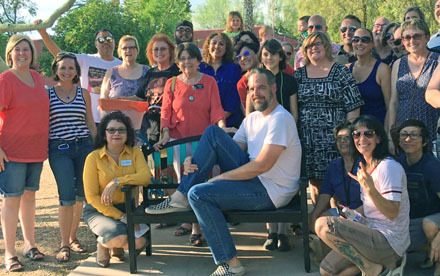 Michael Anderson, seated center, was surprised with a Good Neighbor Bench Award last July from Trellis, a Phoenix-based neighbor who goes above and beyond to help out, nominations are being accepted (photo courtesy of Trellis). Michael Anderson is well known in his Coronado neighborhood for being the guy who will lend a hand to pick up trash in the alleys, help a neighbor fix a mailbox, give a neighbor a ride to a medical appointment, or just be the go-to guy to help out a neighbor in need. Similarly, Blanca Manubag-Melgoza is well known in Phoenix’s historic Pasadena neighborhood for, as one neighbor put it, “looking out for broken street light fixtures, abandoned cars, boarded up houses, starving cats and dogs, and wandering, wayward children.” She also hosts a yearly pancake breakfast in her own front yard to welcome new neighbors, recruit volunteers and listen to their concerns. Not surprisingly, both of these people are past recipients of Trellis’ Good Neighbor Bench Award, which was launched by the nonprofit in the spring of 2015. Honorees receive a one-of-a-kind front porch bench created by a local artist as a reward for being a positive pillar in the community. Each June, NeighborWorks America and its network of local organizations mobilize tens of thousands of volunteers, businesspeople, neighbors, friends, and local and national elected and civic leaders in a week of neighborhood change and awareness. To celebrate NeighborWorks Week (June 2-9), Trellis is once again hosting its annual Good Neighbor Initiative. When you nominate your neighbor, they can win a one-of-a-kind front porch bench, made by a local artist. Anderson, who is past president of the Coronado Neighborhood Association (CNA), was surprised with his bench in July last year, with more than 25 neighbors, Trellis staff, and city representatives turning out for the presentation. Manubag-Melgoza, who received her bench in May 2016, was nominated by London Lacy, who noted that, “Blanca voluntarily makes her neighborhood strong. She is devoted as a city of Phoenix resident and spends many hours being a good neighbor, by learning the issues that affect her community, lending tools to neighbors who need a hand-saw, wrench, or a lawnmower, or to reach a city service and are hindered by a language barrier, or the complexities of dealing with a local municipality. “If anyone deserves recognition, it’s Blanca for being the eyes and the ears of her neighborhood, keeping residents alert and informed of City of Phoenix programs and services and making her neighborhood safe and free of graffiti and blight,” Lacy wrote. But it isn’t only Phoenix residents who can be nominated as a Good Neighbor. Many business owners might also fit the bill. For example, Julie Meeker, owner of Mother Bunch Brewing in downtown Phoenix, is an advocate for women in the craft-beer scene. Meeker even created a beer to advance women’s education in the beer industry, with proceeds donated to The Pink Boots Society. Meeker was presented with a Good Neighbor Award Bench, appropriately, just before Mother’s Day last year at her downtown brewery. To nominate a “Good Neighbor,” visit https://trellisaz.org/goodneighbor/.